These Vegan Zucchini Fritters are gluten free, crisp on the outside and soft and flavourful on the inside! All in under 30 minutes. *Drumroll please* Happy first day of SUMMER! I feel as if I have been counting down to this day my whole…year. Yes, actually. As if you needed one, you now have the perfect excuse to wear flip flops everywhere, make beach references and eat endless amounts of summer fruits and veggies. 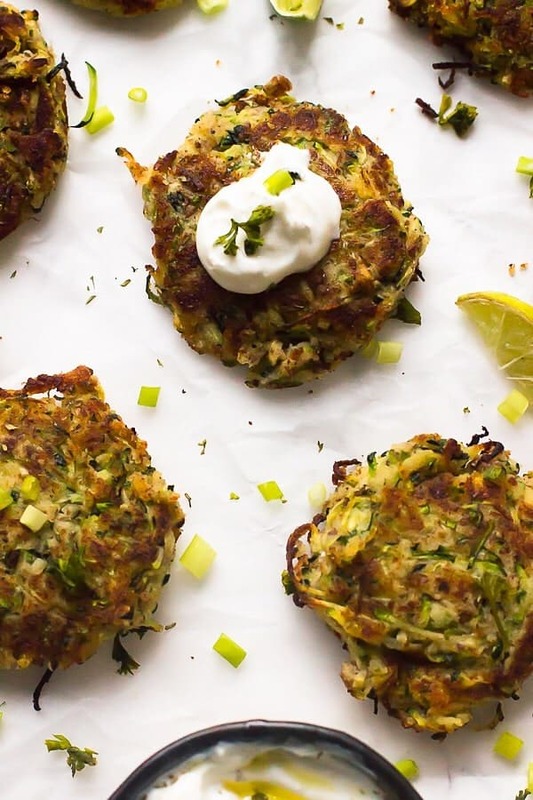 Speaking of summer veggies, these vegan zucchini fritters aka vegan courgette fritters, better be on your list. They are definitely on the list of perfect crispy soft summer meals, all made in under 30 minutes. 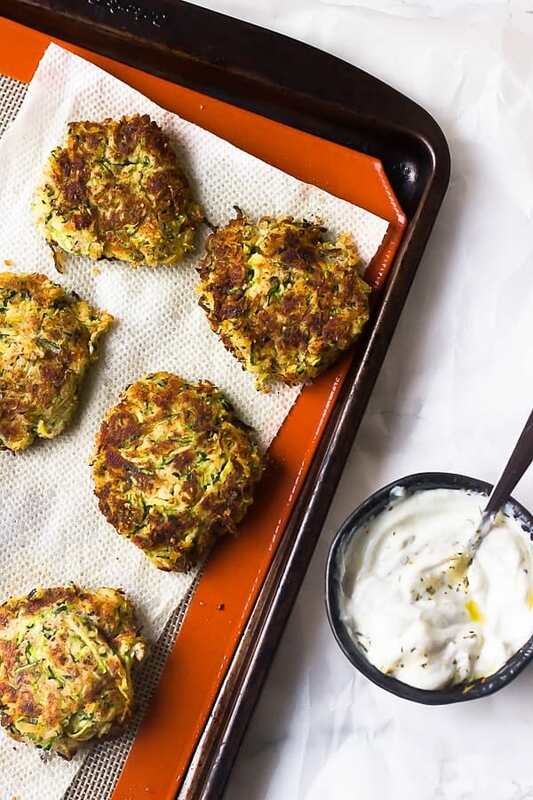 It would be a shame not to make these vegan zucchini fritters, given how simple they are. First, grate the zucchini, squeezing out as much water as possible. Then, mix all the ingredients, and put them in the pan. Simple. The key is squeezing the water out of the zucchini, which is up to 95% water content. This will ensure that your fritters are nice and crispy on the outside, but still soft and oh so incredibly delicious on the inside. Just reading this, I’m getting hungry all over again, and I’ve had this three meals in a row. Oops. Aside from the incredibly taste, vegan zucchini fritters kind of seemed like a must share. A summer meal not requiring an oven, check, that literally looks like summer, check, that is really, really easy to make. Check. Making them gluten free was definitely a must too, because everyone should be able to eat these, as was making them vegan. I usually use coconut flour as a thickener, so it only made sense to use it here. They were so good that I had to resist devouring them right out of the pan. Okay okay, I definitely had a few out of the pan. But look at them; can you really blame me?! I’m not sure if it’s these fritters, or zucchinis in general, or just both but we’ve actually been on a slight zucchini binge here. That, and the new season of Orange is the New Black, of course. This is probably the 4th zucchini I’ve grated in a few days, and my husband just picked up 4 more. At this point, I’m not sure who loves them more, me or him. Either way, I’ll be making even more of these fritters throughout summer. 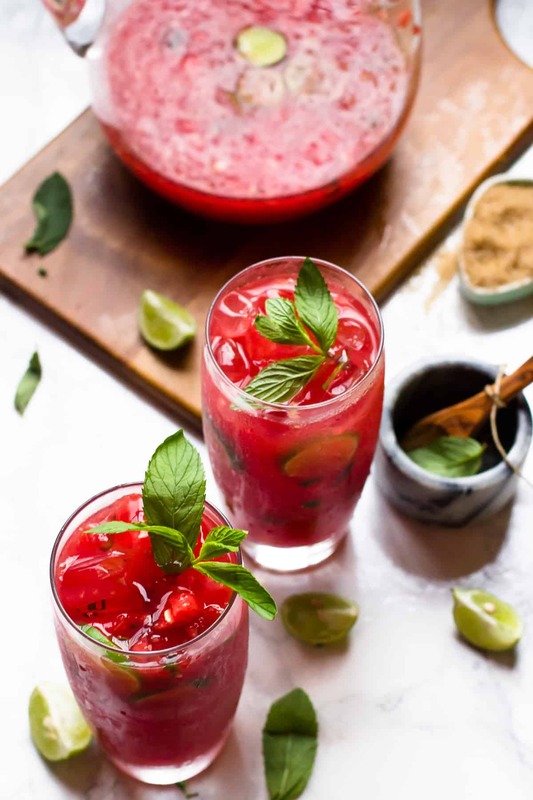 Looks like summer, tastes like summer, it must be summer, right? 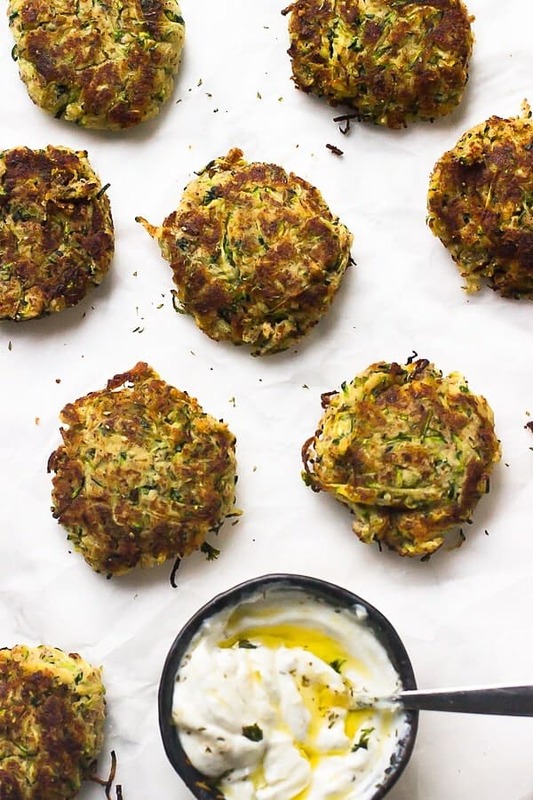 If you try these Zucchini Fritters please let me know in the comment section below, or tag me on instagram with the hashtag #jessicainthekitchen! For more exclusive recipes follow me on Instagram AND on Snapchat: jessinkitchen. Add the grated zucchini to a cheesecloth or thin kitchen towel in a colander over your kitchen sink. Sprinkle with the 1 teaspoon of salt and leave to drain for 10 minutes. After ten minutes, squeeze as much liquid out of the zucchini as possible. This is a crucial step to not making your fritters soggy! Add to a bowl and mix in all the other ingredients until just combined. Form fritter balls the size of 2 tablespoons and slightly flatten them on a plate or baking sheet with your fingers until you get about 10. Heat the oil in a pan over high heat. Add the zucchini fritters, leaving some space between each, and cook on each side until golden brown, about 4 minutes. Flip, and cook for another for minutes. 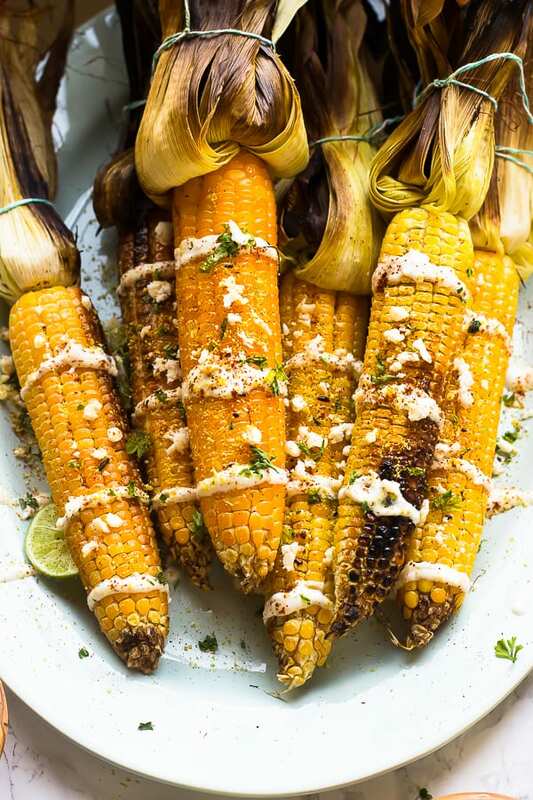 Serve with some vegan sour cream, lime crema or vegan greek yogurt and lime wedges to squeeze over. Enjoy! 1.This makes 10 fritters. This recipe is gluten free and vegan. 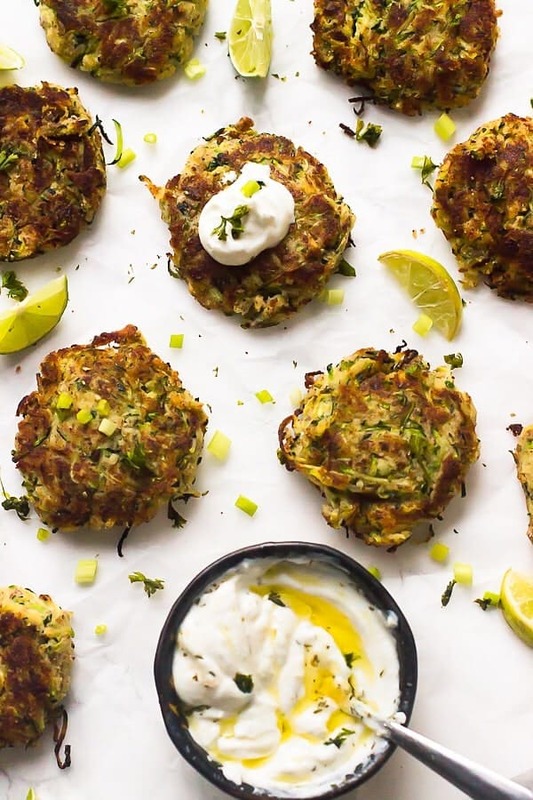 These fritters can be stored in an air tight tupperware container in the fridge for up to a week. I can’t believe today is officially summer. I felt like it’s been here for a while. I’ve needed a new idea for zucchini! Thanks so much Gayle! I’ve made them consistently since this post. So good!! holy crap genius! my dad is grating all the zucchinis we grow while i’m on vacation. i have yet to master a goof vegan fritter, but never tried it with coconut flour yet. i will be making tons wheni get back!! Thanks so much! You’ll definitely enjoy it! I LOVE fritters and have been thinking I need to make them soon. These are inspiring me to make some this week — they look so good, Jessica! I am about to be swimming in squash and zucchini from my garden! I just cannot wait to make these! They look incredible! Oh yum! I would love some summer squash right now too! Thanks Annie! Can I bake then instead of frying? Can I bake them instead of frying? I haven’t tried, but you definitely can! I would try 375 or 400 for about 15 or so minutes. Just test them to see if they are firm enough after that! Can you make quiches with flax egg? I’m so sorry I’m just seeing your question! Unfortunately you can’t, but you can use tofu! Truthfully, I haven’t used buckwheat flour before with this recipe, but quinoa or oat flour would definitely work! Coconut flour is very thick though, so you may need a bit more flour. I would make the entire recipe, then pan fry one to test it for sturdiness. If it isn’t sturdy enough, definitely add a bit more flour, maybe 2 more tablespoons. I hope this helps and enjoy! I ate these fritters for a week straight! P.S. I was so inspired by the recipe I had a large yellow squash in the fridge so I made a few additonal fritters with the squash but substituted parsley for cilantro. It was amazing! SO glad you enjoyed my fritters!! Instead of paper towels you can use a really thin cloth, like maybe if you have an old kitchen towel? That would work perfectly. Thanks so much for your feedback and love the additions you made! This recipe is so good. Being new to this vegan lifestyle has been such a challenge but this recipe could turn anyone vegan. I made ten fritters, ate four and am willing to eat the rest except that I want my daughter to try some. I did add a touch of Cayenne for kick and topped with a dallop of applesauce. The sweet and spice was awesome. Thank you, Jessica. I will be looking for more of your recipes soon. Oh I’m so happy to hear!! Love your changes/toppings!! You’re so welcome and I hope you continue to enjoy my recipes!! I’ve never used flax eggs before so I was surprised how well they held together. I liked the hint of coconut flavor that could be detected. I’m not a big parsley fan for the major flavor. I threw in a big handful. Next time I will try a different herb, maybe dill, some finely minced onion and fresh garlic. Of course, this will make the recipe take a bit longer to make and I needed a quickly prepared recipe for last night. Thank you for sharing! I’m so happy to hear you enjoyed!! Dill would go perfectly with this too! You’re so welcome!! Hi Kate! I know I already answered you via email but in case someone else wants the answer: yes they do freeze well! If you’re freezing I would add a little more flour since they’ll need to thaw. Then you can reheat it in a skillet. I hope you enjoy!! This recipe sounds great! One question, though, do you think I can use chickpea flour instead of coconut? 🙂 Thank you! I haven’t tried it before, but I think you could! I hope that helps! Hi Jessica! I wrote a comment earlier, but it somehow disappeared… My question was whether I can use chickpea flour instead of coconut flour? Thank you! 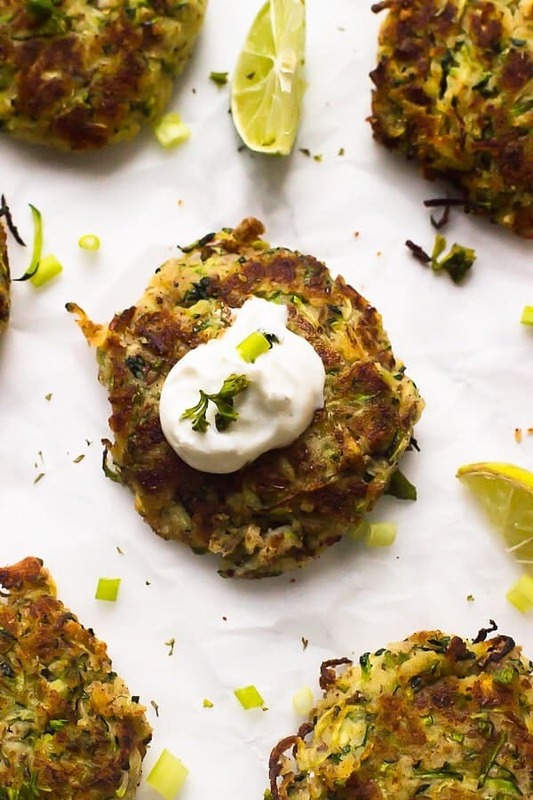 I’ve tried to make these zucchini fritters twice and each time the consistency was off. I found as I was frying them they fell apart. I think the problem is with the coconut flour and the flax eggs. Do you have any suggestions on how to make the fritters stick together better? Sorry to hear that! From reading other readers’ comments about how the fritters stayed together for them, I wonder if yours are too wet? Maybe they need to be a lot drier? However if you definitely want an alternative, I would recommend an egg replacer like Bob’s Red Mill’s own since it works almost like a glue. I hope that helps! I was looking for a way to use up those giant zucchinis from the garden, and this was perfect! Took out the seeds since they get so big. My husband and I polished these off so quick, which means we ate a LOT of zucchini between the two of us. I used Bob’s Red Mill GF flour. Cooked on each side until it was deep golden brown. This recipe can easily be doubled if you have a lot of zucchini since it doesn’t make that much. You could also add some finely chopped onion or onion powder. A keeper for sure, thank you! I’m so happy that this recipe came in hand for your zucchinis!! So glad you guys enjoyed and thanks for sharing your feedback!! You’re so welcome!